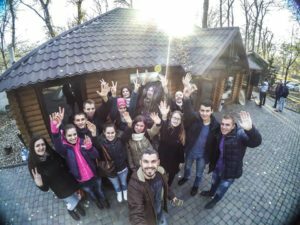 October passed so fast, it is like it lasted only a week, but if we look back we can see that it was nothing like that – just look at AEGEE-Chișinău. Not such a big local, but united, open minded, full of hard working people. A happy family that managed to do a great job and got voted as Local of the Month of October. The AEGEEan: Congratulations! Your local is Local of the Month of October! How did the members and you receive this news? Ana Gancearuc: Thank you, we are immensely happy for being chosen as Local of the Month. Everybody took the news super positively and happily. Hard work pays off! Andrei Dodița: Our newbies are very excited, this nomination is for them and their contribution to the project. It is very important for them to see that their effort is appreciated, this will motivate them to get involved more. How did your local develope in the last months? Ana G.: Our local grew a lot in the past months and we clearly have a stronger team, responsible and active members. We are like a big family now and we cannot let down the antenna and its people. Andrei: Working for the Agora, under stress and pressure, could have broken the relationship between us, but it was the opposite, in the last months teamwork greatly strengthened us. How do you keep your members motivated and keep growing your antenna? 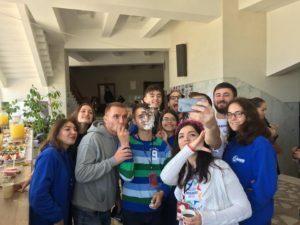 Ana G.: The period after Agora was for recharging our batteries and in two weeks we had a couple of birthdays to celebrate in AEGEE-Chișinău. In a couple of weeks the new board is going to be elected and everyone is super excited and motivated to get involved more in the association and participate actively in AEGEE events, which is a very rewarding and pleasant thing. Andrei: Working together, we developed our team spirit. Now we do a lot of things together, like going out or travelling. This is a beautiful friendship that keeps us together. In October, you organised the Autumn Agora. How did the event go? Ana Tricolici: I still remember the day when Andrei gave us the news that Autumn Agora 2016 would take place in Chișinău. My feelings were a cocktail of happiness and fear, and so many questions about what organising such an event means. There were many troubles, conflicts, problems during the organising period and of course during the previous weeks. The biggest problem was to find the perfect location, the transportation and meals. But you know what, there is no problem that does not have a solution. It was an unbelievable experience with powerful emotions – a real team building activity. We managed to do it with a very small team, but at the same time a very friendly one. Our international helpers were a big help, and I want to thank them all for that. After all the work we did, it is important for us to know that our efforts were appreciated, that the participants really enjoyed and had a nice experience in our city. We put so much love in this event and it was a dream come true. How did the Autumn Agora influence your members? Ana T.: As I said, it was a big challenge that helped us to become a stronger team. It is also a motivation for our new members to be more active and organise other projects and of course to take part in AEGEE projects. We now say between ourselves: “There were a few mistakes in the organisation, but of course when we will organise the next Agora, we will do it better”. What impact has AEGEE-Chișinău in Moldova? Andrei: In the last two years AEGE-Chișinău has grown a lot, and this fact is confirmed by the numerous prizes we won: a special award for civic activism, the prize for the most active NGO, the prize for the best project etc. 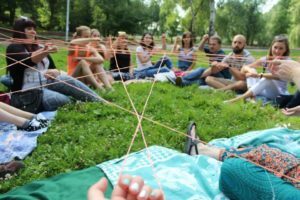 This way, AEGEE-Chișinău became a youth resource centre, in process of continuous training. We also started to delegate members to the National Youth Council of Moldova (NYCM) and now we have two members on the board of NYCM, and one of them is the Vice-President. We are now a youth representative structure and our voice is heard more often. We are happy that a lot more people know about it now and that different youth portals e-mail us asking to post about our awesome association (especially when they find out via social media about the different events that we are organising). What is on your list for the near future? Andrei: On our list for the near future is to have the local Agora and elect the new board for the year of 2017, organise a team building with all the members, participate at some Winter Events and get everybody involved in that. We missed organising a Summer University last summer, as the Agora took over and we had lots and lots of work to do, so that will change in the next year, we are eager to organise a new one and we are already thinking about the topic. Besides projects that we used to organise, we are going to make AEGEE a real incubator for young people, where we will focus heavily on non-formal education. The AEGEEan: The Autumn Agora was organised by AEGEE-Chișinău and AEGEE-Europe in partnership with the Ministry of Youth and Sports and the Municipality of Chișinău, financed by the East European Foundation in Moldova, the Embassy of Sweden and the Ministry of Foreign Affairs of Denmark. Agora Chișinău’s digital partner was Star Net “we change the future”. Other partners involved in the project and organisations that made a significant contribution to the organisation of the event were: Agepi, Draft, Minister of Agriculture and Ministry of Agriculture and Food Industry, Chateau Vartely, Apă Bună, The Railway of Moldova, Institute of Labour, Red Bull, ADR Center and Classic Mobil. ← AEGEE wants More Than Education!